March the weather in London is quite chilly and miserable so its the perfect time to explore the buildings found all over the city. My friend Adel who actually lives in London now took me out to Greenwich for the morning. Greenwich is a district of South East London, England, and is quite famous for being the spot where you can stand on the Greenwich Meridian (0° longitude) and Greenwich Mean Time. Personally I think this is something I will come back and do in the summer when there is not an icy wind blowing about. Dressed warmly and wrapped up in our scarves we braved the cold and wet London had to offer that Saturday morning. Greenwich became the site of a royal palace, the Palace of Placentia from the 15th century, and was the birthplace of many in the House of Tudor, including Henry VIII and Elizabeth I. The palace fell into disrepair during the English Civil War and was rebuilt as the Royal Naval Hospital for Sailors by Sir Christopher Wren and his assistant Nicholas Hawksmoor. These buildings became the Royal Naval College in 1873, and they remained an establishment for military education until 1998. Luckily the historic rooms within these buildings are open to the public. As we entered the grounds we were greeted by the the Discover Greenwich Visitor Centre which provided an introduction to the history and attractions offered by the Greenwich World Heritage Site. Our note states that we are freezing here at Greenwich! The Centre explains the history of Greenwich as a royal residence and a maritime centre and is definitely worth a visit before entering the main building. Inside this centre you can leave notes about your experiences here at Greenwich. Our note states that we were definitely freezing out in this weather. As we walked from the river through the Greenwich site you cant help but be awestruck by the immensity of the pillar filled buildings. 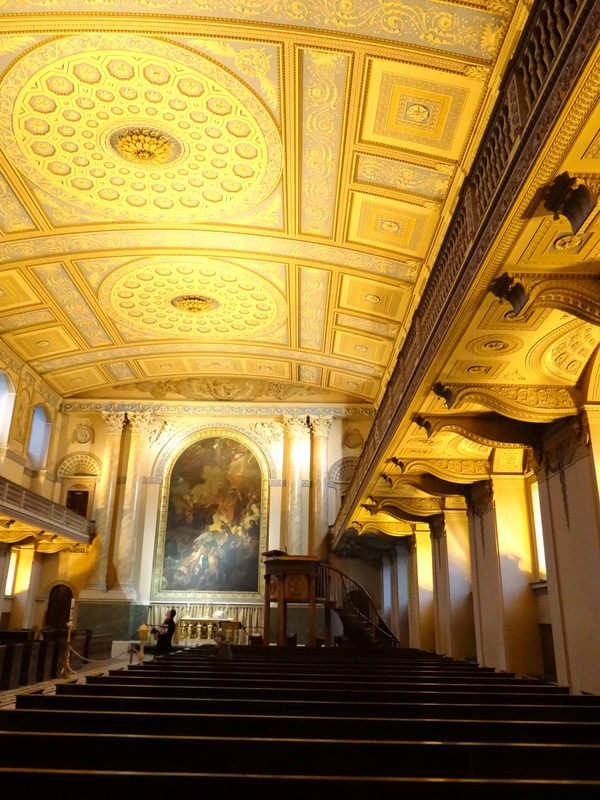 The Old Royal Naval College is the architectural centrepiece of Maritime Greenwich and within the complex is the former college dining room, the Painted Hall in King William Court which was painted by James Thornhill. King William Court is famous for its baroque Painted Hall, which was painted by Sir James Thornhill in honour of King William III and Queen Mary II . Walking up the stairs and through the door of the Painted Hall my breath was taken away by this magnificently painted ceiling. Since 1998 the site has had new life breathed into it through a mix of new uses and activities and a revival of the historic old site. This fabulous Hall has been used in a couple of films! Public concerts are regularly held here as well as a wide variety of business and cultural events. Its easy to see why the site is regularly used for filming television programmes and even feature films. Productions have included Patriot Games, where an attack on a fictional royal family member, Lord Holmes, was filmed. Other films include Four Weddings and a Funeral, The Madness of King George,The Mummy Returns, The Avengers (1998) and Lara Croft: Tomb Raider (2001). I am definitely going to watch these films again and be on the constant lookout for this beautiful hall. You can definitely end up with a sore neck after a visit to this hall. Luckily they have mirrors placed on trolleys so you can have a look at the ceiling without straining your neck. Playing around with the mirrors! 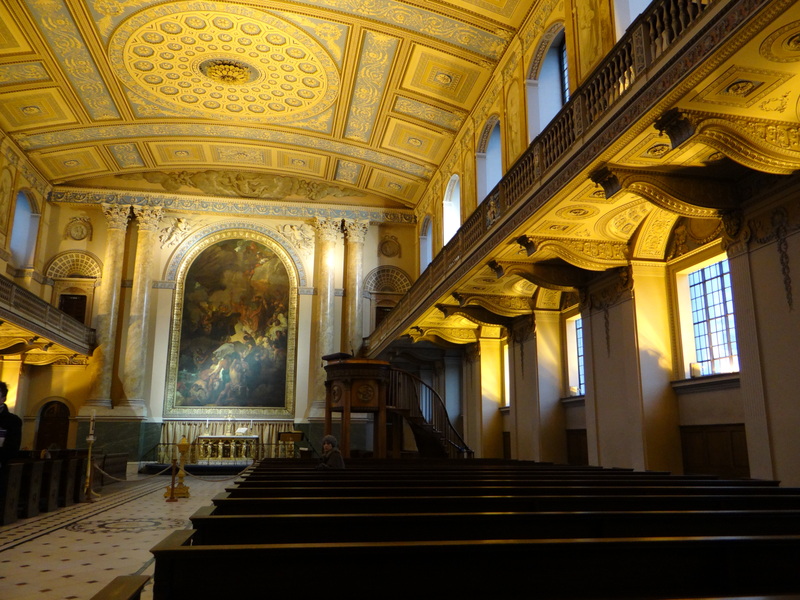 The last building we explored was the Queen Mary Court which houses the Chapel of St Peter and St Paul (designed by Wren but not completed until 1742). Its present appearance dates from 1779–89, having been rebuilt to a design by James Stuart after a devastating fire. The Chapel is dedicated to St Peter and St Paul, both of whom have connections with water and the sea. The chapel is full of naval symbols, intended to remind the residents of the Royal Hospital for Seamen, who had to worship there daily. The Chapel is not heated so we left after a while in search of a cup of hot coffee. I went past Greenwich on a tour up the Thames a couple of years ago and this post has reinforced that it’s a place I need to visit properly (whenever I should be in that part of the world again!). Very nice! I loved Greenwich, but we didn’t go in that hall. wow such beautiful architecture. I think all my photos of London have a drab sky as well. Does the sun ever shine there??? Its quite rare to get clear blue skies in London….but I was quite lucky last summer and got some beautiful sunny shots. Thanks Patricia and a very very happy 2014 for you!! So interesting about the movies being filmed there. Quite the back drop! Love the shots of Long Hall! Glad you braved the cold to bring this place to the blogosphere. Thanks Rusha it was definitely worth braving the cold for!! Such a beautiful Hall!! I agree Jude, you should definitely go in spring or summer so that you will be able to walk the grounds and not have to hurry from building to building because its freezing out! Reminded me of when I was a boy – my dad used to take me there often – my favourite was the Cutty Sark. It isn’t always cold and miserable in March! This was my first visit so I think I should definitely go back again in the summer someday so that I can explore the whole area! Dit lyk beslis asof julle lekker baie koud gekry het Janaline. LOL! Dankie Sonel!! Was n uiterse koue dag gewees! Awesome post and fabulous pics. I love Greenwich! Thanks Suzie! It was a cold but absolutely stunning day! Greenwich is so beautiful! Would love to come back in summer and walk around the grounds some more. I visited years ago – definitely something I need to do again!